There is so much Switzerland has to offer visitors and new residents. From skiing down the Swiss Alps and swimming in its beautiful lakes to engrossing oneself in the country’s rich history, those traveling to one of Europe’s most entrancing places have so many possibilities to choose some. So where to start? With the cuisine, of course! A country’s culture is reflected in their food. Recipes and traditional meals have histories that go back generations across Europe. Switzerland is no exception. The deliciousness of their chocolate, for example, is known worldwide and has been a part of the country’s history since the 17th century. That’s over four hundred years of amazing cacao confectionaries! However, sweets are not where the Swiss food reputation ends. When it comes to dipping bread in melted cheese, it all starts in Switzerland. Fondue is Swiss through and through. Around since at least the late 17th century, this Swiss national dish is a delicacy of community and interactivity. Family and friends sitting around a pot filled with bubbling cheese, long-stemmed forks in hand, is a common scene in both Switzerland and other parts of the world. Its popularity grew in North America doing the 1960’s with no signs of going back into obscurity. Fondue pots are a staple on many wedding registries and if you don’t have one, you have a friend that does. But where should you go to eat fondue in the land of its creation? The simple truth is that you’re going to be able to find somewhere to eat fondue in Switzerland no matter where you go. A fancy restaurant, a little cafe, or a tourist-loving resident’s house will each be able to accommodate your melted cheese craving. If you’re looking for the best the country has to offer, however, the seven places below are where you need to start. Those looking for truly magnificent and traditional fondue should head to Fribourger Fonduestübli. Specializing in two Fribourger cheese blends - vacherin fribourgeois on its own or moitié-moitié, a dual blend which is mixed with gruyère - this Zürich restaurant is as authentic as it gets. Here you’ll find a healthy mix of tourists and locals, a great wine list, and reasonable prices for amazing fondue. The cheese aroma is quite thick so be careful what clothes you dine in if you don’t want them smelling delicious by the end of the night and beyond. Be sure to chase your meal down with a shot of kirsch, a Swiss fruit brandy that helps with digestion. Smooth, rich, and velvety fondue is found in this out-of-the-way, chalet-style restaurant in Geneva. Simply take tram 12 from the city center to the Granges-Falquet tram stop and follow the tram line until you reach Le Gruyérien. Cheese options include traditional moitié-moitié, a lighter vacherin fribourgeois, and a goat cheese version. Take in the friendly atmosphere while enjoying a casual Swiss dining experience. It will be a fondue lunch or dinner well worth the trip. As the largest city in Switzerland, Zürich is filled with fondue options big and small. If you don’t mind a bit of travel east of the city, though, you can find yourself in the quaint, locally beloved restaurant of Chäsalp. Offering an array of cheeses and dippers for your dining pleasure, Chäsalp isn’t afraid to lean away from tradition. You can partake in a multitude of fondue flavors including mushroom, apple, chili, and even tomato sauce. If you’re looking for dinner with champagne and some added romance, give their ‘sparkling’ option a try. Tourists tend not to wander into this intimate little eatery, so there’s no better choice when looking for truly authentic fondue dining experience. Owned by the same people as Fribourger Fonduestübli, Chässtube Rehalp's fondue is equally as delicious but found in a larger building. The spacious environment is usually packed, so be sure to make a reservation in advance. This sanctuary of cheese can we found on the edge of Zürich. Filled with tourists and locals alike, you’ll be sure to remember the night as the strong scent of cheese lingers on you far after dinner is over. Its warm wood interior is the perfect place for a romantic - if a little pricey - evening. If you’re trying to avoid tourists during your Switzerland fondue excursion, you might think it’s a good idea to pass up this atmospheric restaurant. Swiss Chuchi attracts a ton of tourists to its tables but you’d be doing yourself a disservice by not checking it out. The cost alone is worth dining within at least once. Its lively atmosphere isn’t all travelers either. Zürich locals continue to flock through its door in the back alley’s of the city’s old town district to enjoy true classic Swiss fondue. Offering interior and exterior seating, you’ll be able to indulge the delicious melted cheese even on a cold afternoon, just be sure to bring a blanket. Why not enjoy the sites of Zürich as you eat delicious fondue? With the Fondue Tram, you can do just that! 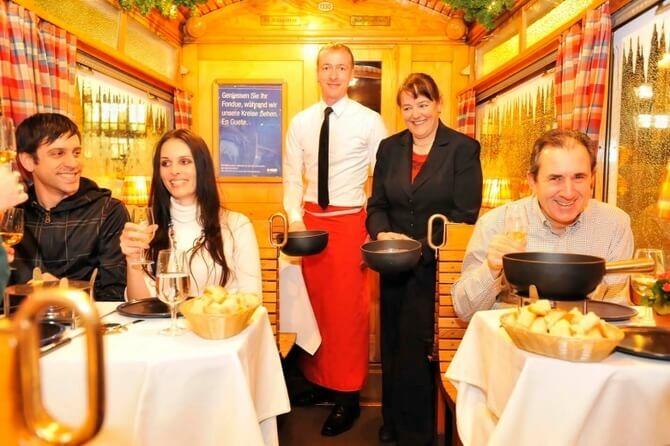 Departing from Bellevue station, the Fondue Tram is a seasonal opportunity you should not pass up if you have the chance. No other place offers you the ability to take in every view across the city while indulging in decadent melted cheese. Filled with great atmosphere and excellent customer service, this is a unique experience you’ll only find in Switzerland. True fondue luxury is found at the El Paradiso in St. Moritz. Their menu combines classic traditions with modern French and Italian influences, giving the dishes, including fondue, a true uniqueness all its own. It’s really when you combine the awe-inspiring view with your meal, however, that this restaurant really shines. Much can be said for ambiance and you’d be hard pressed to find a better atmosphere than out on El Paradiso’s stylish sun deck. It has become a seasonal favorite, so be sure to book a reservation well in advance of your trip. These are some of the best, most popular fondue restaurants you can find in Switzerland but they are definitely not the only ones, not by a long shot. In your travels you could very well stumble onto a hole in the wall cafe or local eatery that you’ll swear has the best fondue in the world. If you do, feel free to share it with everyone you can so they can experience it themselves. We all deserve a chance to find a new dollop of fondue heaven.